HumanGeo expertise in high-throughput data collection and integration enables detailed, complex analysis of massive data sets. Our data platforms leverage modern Cloud technologies, including MapReduce, real-time stream processing, on-demand computing, and NoSQL databases to enable Big Data applications built from the ground up to satisfy our partners' needs in data discovery, data integration, and data analysis. 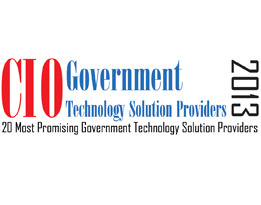 We are proud to have been selected as one of the Top 20 Most Promising Government Solutions Providers for 2013 by CIO Review. From the battlefield to the boardroom, HumanGeo develops mission critical capabilities for high-stakes environments. Our proven practice of Deskside Development integrates customer input throughout the solutions development cycle. This approach, pioneered in support of US Special Operations, enables us to quickly diagnose an organization's capability gaps and identify the optimal technologies and systems to bridge them. Our commitment to this philosophy has earned us a reputation for rapidly developing solutions that meet our partners' core business and workflow needs. From our website, which leverages Amazon Simple Storage Service (S3), to the tools we host online that make use of Virtual Private Cloud (VPC), Elastic Compute Cloud (EC2), S3, Elastic MapReduce (EMR) and a variety of other AWS technologies, we're big believers in the power of AWS for helping to scale, manage, and maintain the solutions we provide. HumanGeo products help our clients reduce uncertainty, quantify risk, and enhance the quality and speed of decision making. From helping government agencies achieve strategic and tactical awareness to enabling video game companies to better understand their customers, our products combine geospatial visualization, social media collection and analysis, and risk management to solve our customers' toughest problems. MineShaft enables full spectrum search, visualization, and analysis of social media through textual, temporal, and geospatial enrichment. Enhanced Workflows. Users can create custom search profiles and watchlists, allowing for easy access to targeted data and tracking of issues across the globe as well as across different social media platforms. Powerful Visualizations. MineShaft offers customizable and impactful digital reports based on social media trends and analytics. ISEAX provides users with a real-time capability to analyze, triage, and exploit streaming social media content. It processes all content and enriches each piece of data with semantic and geospatial context. User-Driven Event Detection and Content Classification. The ISEAX user interface enables users to create personalized event categories and categorize streaming content using these events. Additionally, users have the ability to tag and track specific users allowing for easy monitoring and exploitation of all content associated with a user. Entity Correlation and Similarity Detection. Upon ingestion, all social media authors are indexed and scored using a proprietary correlation algorithm. ISEAX has an interface that enables users to drill into to those entity similarity scores and find correlated users within or across platforms. ISEBOX amplifies weak signals to fuse disparate data sets and detect geospatial patterns. Geospatial Manipulation. ISEBOX enables users to intuitively manipulate geospatial datasets to ascertain geographic co-incidence and identify temporal and geospatial patterns. Data Context. ISEBOX enables users to incorporate their own custom geospatial data sets, and enhances the user’s perspective by providing foundational data layers of places of interest and streaming social media data. Our capabilities can help you use Social Media and a variety of other data sources to derive insights about the world and your customer base. We can help you understand the who, what, when, where, why, and how of human geography. We're experts at telling stories with data. We can help you move from raw data to amazing visualizations quickly. We're fans of Leaflet, D3, and many other of the latest geospatial and general purpose data visualization libraries. Check out our Open Source framework for creating powerful geospatial visualizations, the Leaflet Data Visualization Framework. We offer advanced, customizable routing and travel analysis capabilities that incorporate Social Media, OpenStreetMap, and other foundational geospatial data sources to provide better, more accurate predictions.